A FOUNDING FARMER of LA Urban Farms, Wendy Coleman, second from right, with partners Niels Thorlaksson and Jennifer Crane joined by team member Melanie Dorsey. Gardens can grow just about anywhere these days, even in the arid landscape of our fair city without soil, with minimal water and on a stackable Tower Garden from LA Urban Farms. Just ask the mayor—Eric Garcetti—and First Lady Amy Elaine Wakeland. They have 14 towers at their home, the Getty House in Windsor Square. The vertical planters, at 30”-round, fit in most backyards, patios and on rooftops, says Wendy Coleman, a Founding Farmer at LA Urban Farms. Coleman was on hand at the recent Windsor Square-Hancock Park Historical Society’s “Living Alfresco” gardens tour. The Getty House was one of six private gardens on the tour. The 14 towers were placed in the mayor’s backyard last summer, soon after he was impressed by a few he saw at a ribbon cutting he attended in Hollywood, said Coleman. Based on an aeroponics system from the Epcot Center in Walt Disney World, each tower has a mineral-rich reservoir at the base, from which water is pumped through the center of the tower, to the top and cascades back down, feeding peppers and eggplants to marigolds and bok choy, along the way. Set in spun volcanic rock, the plants grow in half the time, with 90 percent less water than the traditional farming model, and without pesticides, beams Coleman. Customers of the Tower Gardens range from apartment dewellers to chefs at leading restaurants, and, of course, Getty House. 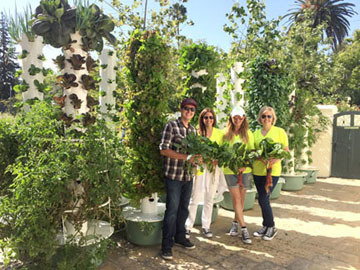 Sharing the excess output of produce from the the Getty garden has evolved into a charity project with the LAMP Community. Coleman and helpers drive most of the Getty harvest—from some 616 herbs, vegetables and edible flowers—to the homeless facility downtown. “That’s one of the best parts about that garden. Freshly harvested vegetables with all the nutrients are taken to people who need them the most,” said Coleman. Residential systems require adding a little water to the top of the tower once a week, while commercial systems are automated. Both require pennies-a-day of electricity. A do-it-yourselfer can get started with one tower of 28 plants for about $50. Or, for $150, customers will be equipped with a fully planted tower plus weekly service visits for one month. The latter option can be continued indefinitely for hands-on help. Either way, it’s a modern take on an ages-old way of life that is all the rage in Los Angeles: you can pick fresh arugula and lettuce for your salads and kale for your smoothies just a few steps outside your door. “We’re encouraging people to grow their own food, and we teach them how to do it,” says Coleman. « New power poles come to Larchmont Blvd.